I am Mary Felzkowski and I want to continue to represent YOU in the 35th Assembly District! 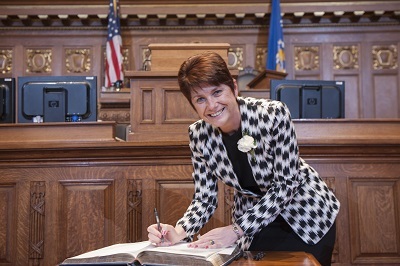 Mary Felzkowski, formerly Mary Czaja, was first elected to the Wisconsin State Assembly in 2012 and is currently serving her third term as Representative for the 35th Assembly District. A lifelong resident of Lincoln County, Mary is the owner of C.I.S. Insurance Group, with offices in Tomahawk and Rhinelander. She is a graduate of Tomahawk High School and the University of Wisconsin – River Falls. Mary has two children, three step-children, and three grandchildren. Mary comes from a family of independent business owners. Her father, Edward Behling, owned and operated Tomahawk Tree Farm and Behling Insurance. Mary’s grandmother, Dolly Roberts, and mother, June Behling, operated the Bowling Alley Grill and founded June’s Delicatessen in the Nokomis area. Her uncles, Richard and Gerald Roberts, founded Roberts Berry Farm, now owned by her brother Tom and operating as the Tomahawk Berry Farm. In her free time, Mary enjoys motorcycling, boating, and snowmobiling with her husband, Fries. Most importantly, she loves spending time in the great outdoors with family and friends. Mary currently serves as a member of the Assembly Committee on Finance and the state budget-writing Joint Committee on Finance.